both of those were firmly established, showed that even a superhero doesn't have to wrap himself in a flag, like they did, to prove his patriotism. Fighting Yank debuted in Startling Comics #10 (September, 1941), which was published by a second-tier outfit variously known as Better Publications, Four Star, Standard Comics and a few other names. His original writer was Richard Hughes, who later edited The American Comics Group, where he introduced such characters as Commander Battle, John Force and Herbie Popnecker. The artist was Jon Blummer, who also created or co-created Ultra-Man, Hop Harrigan and Little Boy Blue for All-American/DC Comics. Much of the later artwork was provided by Jack Binder's studio, which also handled Bulletman for Fawcett Publications, Daredevil for Lev Gleason, and many other features. In everyday life, Fighting Yank was Bruce Carter III, who had an identical ancestor, also named Bruce Carter, in the War for Independence. In times of crisis, the earlier Bruce would manifest himself in spirit form, and help out. (DC Comics later used a similar schtick in its war series The Haunted Tank.) It was the Revolutionary War Bruce who showed the World War II Bruce where to find a magic cloak able to protect him from harm and impart super strength. In addition to the green cloak, Bruce III's Fighting Yank outfit included several 18th century fashion motifs, such as tri-corner hat and square buckles, and a modern-style American flag (greatly understated, compared to Captain Flag, Fighting American and others of his sub-genre) on his chest. His girlfriend, Joan Farwell, was in on the secret, and usually accompanied him on adventures. Depending on the needs of the story, she could be either an assistant or a hostage. Fighting Yank met with quick success, permanently ousting Captain Future from the Startling Comics cover. He himself was frequently upstaged there by Pyroman, but starting with a September, 1942 cover date, he also had his own comic — making him the only Standard Comics superhero other than The Black Terror so featured (unless you count Supermouse). His third venue was America's Best Comics, Standard's answer to DC's World's Finest Comics, an anthology of the company's most popular characters. He started there in #9 (April, 1944) and stayed until the title folded, in 1949. 1949 was also the year he lost his own comic. Startling Comics had folded the year before, so he was homeless. It was a longer run than most 1940s superheroes got, but once it was over, he was never seen in that form again. His name, however, was used elsewhere. 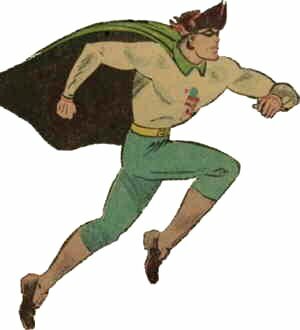 Even while his series was running, Marvel Comics introduced a very minor character called Fighting Yank; and while this Fighting Yank was dropped almost immediately, he's still mentioned on rare occasions as a small background element of the Marvel Universe. Mego, a toy company, brought out an action figure of that name, but it was sued into oblivion in 1999, as a direct rip-off of Hasbro's G.I. Joe. In 2001, he and the rest of the Standard/Nedor/etc. crew were resurrected as denizens of "Terra Obscura", for a crossover with a modern-day superhero named Tom Strong. Most oddly, AC Comics, which publishes its own versions of quite a few old-time superheroes (e.g., Ghost Rider, The Owl, Phantom Lady) brought out its own Fighting Yank in 2002. This one is set in the 1950s, has a kid sidekick named Quick, and dresses like Uncle Sam in spandex. Apparently, the name is the only thing from the original character that was retained.